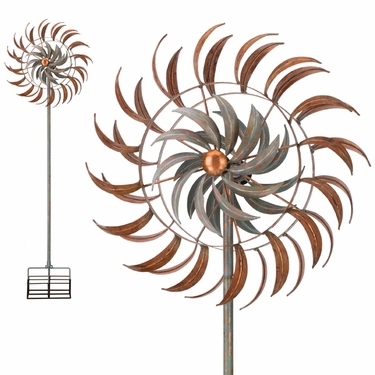 Bring excitement and dimension to your landscape with our latest Rotating Kinetic Stakes. They have the added feature of the blades rotating on the top of the stake to help the double blades face into the wind! Available in five styles: Copper Petals, Rustic Wheel, Bronze Flower, Rustic Gears and Confetti. Size: 24" x 13.5" x 75"H, 10.5 lbs. Watch our New Rotating Kinetic Stake in Action!